In the fall of 1700, Awat’ovi, a Hopi community that had existed peacefully on Arizona’s Antelope Mesa for generations, was decimated, its inhabitants the victims of a massacre carried out by their neighbors—fellow Hopi Indians. The story of that night, during which scores of men, women, and children were brutally slain, has been shrouded in mystery and fraught with controversy ever since. 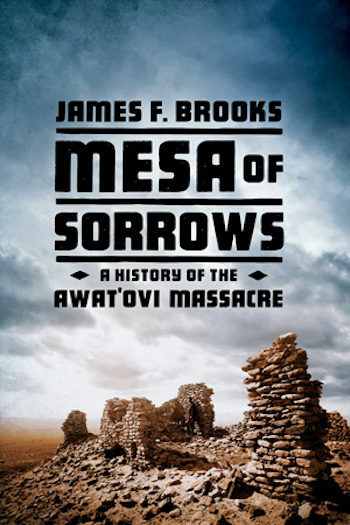 In Mesa of Sorrows: A History of the Awat’ovi Massacre, James F. Brooks draws on oral history and extensive archival and archaeological research to unravel the story and its significance. Though many theorized the attack was in retribution for Awat’ovi’s willingness to welcome Franciscan missionaries or for the residents’ practice of sorcery, Brooks reveals that the Hopis lived in a society in which cycles of ritual acts of purification were deeply engrained. As he recounts this haunting tale, Brooks questions how communities can confront a violent history better left untold, and he lends insight into why communal violence still plagues us today. Vivid…. Brooks tells this tragic story with great sensitivity and power, offering readers a fascinating perspective on the history of the American Southwest. Mesa of Sorrows opens an enthralling window into an ancient culture but when it comes to the story of Awat’ovi, it also offers a reflection that any society forgets at its own peril. In this rich work of anthropology, archaeology, and personal sleuthing, James Brooks carefully unravels a mystery of enormous violence that convulsed the desert Southwest some three hundred years ago—and that still sends off psychic shockwaves. Here is a haunting tale that is also deeply revealing, not only about the ancient Hopi Indians but all human societies.